Soft water keeps skin looking vibrant and clothes looking brighter! 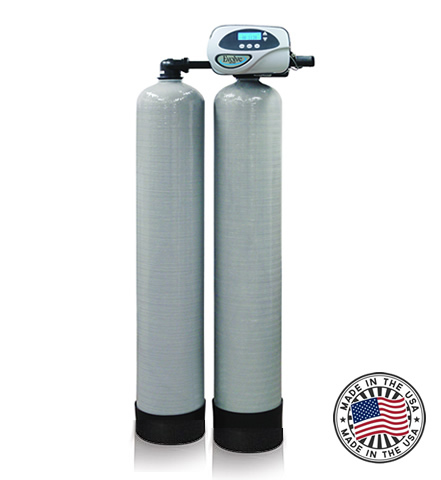 Futuramic’s Clean Water Center offers highly efficient demand water softeners custom sized and competitively priced. Our water supplies throughout the U.S. are plagued by the unpleasant and costly effects of hard tap water! Hard tap water causes build-up throughout your home’s entire plumbing system and reacts with soaps and detergents, making your clothes stiff and scratchy. All this adds up to endless hours of costly clean-up and expensive repairs! It leaves your hair and dull and lifeless…and your skin dry and irritated. 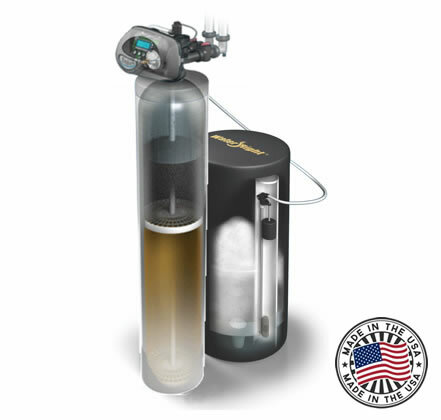 The newest technology in self-sanitizing water conditioning systems — with a patented solid-state control valve — unlike any other system. Softening water is just the beginning for the EVR. It’s also a self-chlorinating unit that delivers and maintains a higher level of water quality eliminating unwanted tastes and odors. And our patented IQ2 controller allows your EVR system to be fine-tuned specifically to your water treatment needs. The result is a high-quality water treatment solution that saves you water and money. Around-the-clock schedules and busy lifestyles require more water and more capacity. EVR softeners are available as twin systems for high capacity water treatment when you need it – 24 hours a day, 7 days a week. Evolve Series® EVRC water conditioners are ideal for reducing levels of hardness while also handling common odor andtaste problems associated with municipal water. Configured with high-performance resin media and activated carbon, this system not only serves to soften water but also acts as a filter, removing chlorine and other unwanted tastes. The Evolve Series® RC system’s unique design performs like two units in one! 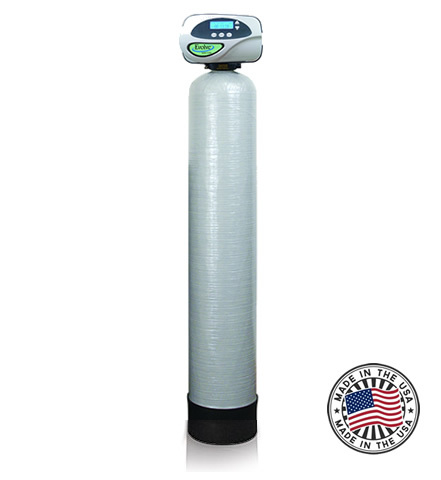 The EVRC eliminates hardness and chlorine with just one tank, saving money, water and resources. Configured with high-performance resin media and activated carbon, this system not only serves to soften water but also acts as a filter, removing chlorine and other unwanted tastes. The environmentally-friendly tank design eliminates the need for two systems by combining two medias into one tank. The carbon also protects the resin from highly chlorinated water, helping avoid unnecessary mineral replacement, saving you time and money. The EVRC conditioners feature the IQ Controller™, Water-Right’s newest and most advanced microprocessor based valve system. This revolutionary controller allows your EVRC system to be fine-tuned to your specific water treatment needs and serves as the system gatekeeper to minimize water and salt consumption. The result is a highly effective, computer-controlled filter with the power to consistently deliver quality water. Evolve Series® EV2C water conditioners are ideal for reducing levels of hardness while also removing ammonia and handling common odor and taste problems associated with chloramine in our municipal water. Configured with high-performance Crystal-Right media and activated carbon, this system not only serves to soften water but also acts as a filter, removing chloramine and other unwanted tastes. Chloramine is commonly used as a secondary disinfectant in municipalwater distribution systems as an alternative to chlorination. 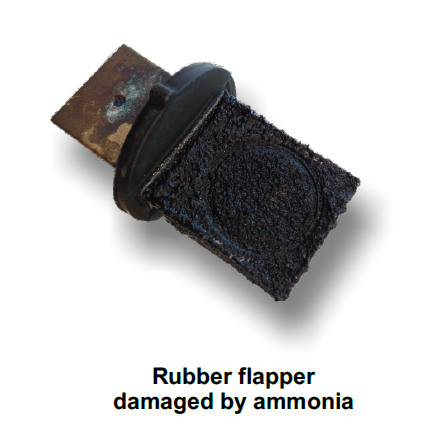 Chloramine contains ammonia which rapidly increases the break down of rubber orings, gaskets, washers and flappers found throughout your plumbing. Chloramine also contains chlorine which can cause skin irritation and isharmful to fish. 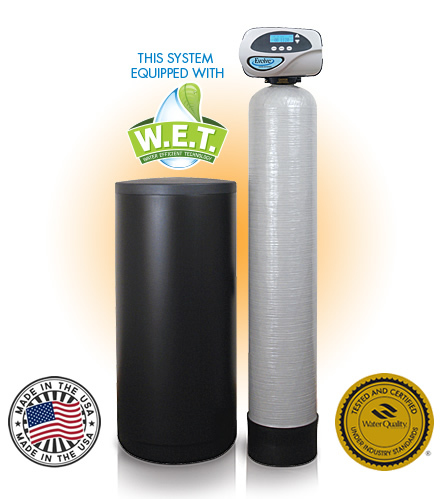 This system removes chloramine and softens your water! The Evolve Series® 2C system’s unique design performs like two units in one! The EV2C eliminates hardness and chlorine with just one tank, saving money, water and resources. 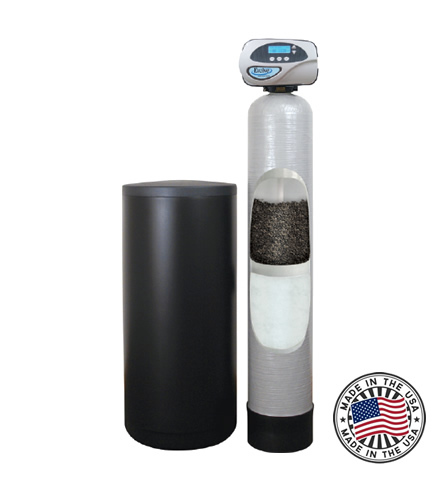 Configured with high-performance Crystal-Right media and activated carbon, this system not only serves to soften water but also acts as a filter, removing chloramine (chlorine & ammonia) and other unwanted tastes. The environmentally-friendly tank design eliminates the need for two systems by combining two medias into one tank. The EV2C conditioners feature the IQ Controller™, Water-Right’s newest and most advanced microprocessor based valve system. This revolutionary controller allows your EV2C system to be fine-tuned to your specific water treatment needs and serves as the system gatekeeper to minimize water and salt consumption. High efficiency system that saves money, water and salt! Extremely low energy usage, only about $1.50 a year! Delayed regeneration so it cleans itself when you’re not using water! Soaps: 70% on dish soaps, laundry soaps, shampoo and more! Plumbing: Stops hard water buildup on fixtures, dishwasher and hot water heater! Protects plumbing from chloramines (chlorine & ammonia)! Protects your plumbing fixtures from the chloramines in city waterb by removing chlorine & ammonia! For city and rural well water applications where 24-hour soft water is needed, Futuramic offers a twin alternating line of equipment. Ask a Futuramic representative if a twin system is right for you. Evolve Series® EVBRP backwashing filters are custom-configured to address the specific water treatment issues of any household. Used alone or in combination with other Water-Right conditioners, IMBF units deliver exceptional results. Every EVBF unit is built from the ground up using special media and media mixes to treat one or several water quality problems. As always, we can perform basic water testing right in your home to determine the proper media formula for your household. We can then recommend the right BF configuration or combination system needed to provide the best water quality possible.